"A beginner’s guide to Integrating the many parts of the PA"
Welcome to the circus that is the world of the PA! Multi-tasking, working to multiple managers, dealing with multiple demands on our time, keeping multiple plates spinning – we almost need to have multiple personalities to match! Being a PA or administrative assistant is no easy task. You need to be able to wear the many hats of a wide range of roles and your manager will quite often expect things of you that you are unfamiliar with. They may presume that you already know what to do without being told, and they will probably expect that you automatically know their preferences and be able to organise logistics successfully on their behalf. You also need to be able to drop everything at a moment’s notice, adapt to new situations, manage your Executive’s working life (and, for some, aspects of their personal life too! ), and remain calm and unflustered throughout. How can you build the skills to lead the circus successfully alongside your manager? Details of a number of books and online resources. So - put on your lion-tamer outfit and let's join the fray! There are loads of reasons to visit office* - to meet and research new ideas with 150+ top suppliers, take your training into your own hands with 36 CPD accredited seminars and 10 free Keynotes or to get involved in Hot Topic discussions to share and receive the latest knowledge with your peers. 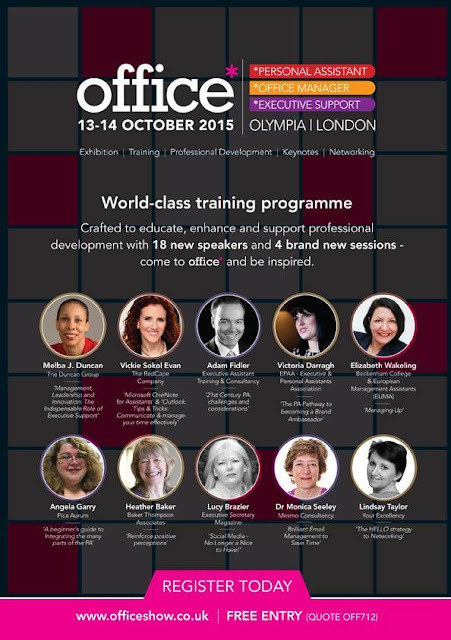 office* is completely free to attend so register now to join over 4,000 office professionals for an educational, inspiring and fun day out of the office.